Martin Durkin M.D. 82, of Glen Ellyn. Beloved husband of Diana (nee Stone Welsh) loving father of Gina (Jordan) Marty (Wendy) Pat (Tammy) Mike (Isabel) Brendan, and Allison(Pedro). Dear grandfather of Conor, Adam, David, Brendan, Robert, Margaret, Anna, Joseph, Samuel, William, and Matthew. He is preceded in death by his wife Anna Mae (nee Walls). 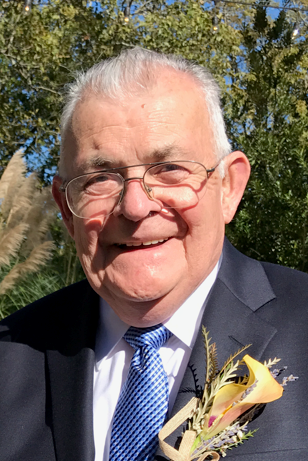 Retired Physician and Professor of Medicine at Loyola University where he founded the Section of Gastroenterology in 1972 and served as the section chief until his retirement in 2000. Visitation Friday, November 30 from 4pm until 8pm at The Leonard Funeral Home, 565 Duane St., Glen Ellyn, IL 60137. Mass of the Resurrection, Saturday, December 1 at 11am at Our Lady of the Angels Chapel - Wheaton Franciscan Sisters, 21W171 Roosevelt Rd Wheaton, IL 60187. In lieu of flowers: donations to Wheaton Franciscan Sisters or Comfort Care Blanket Project c/o Loyola University Medical Center Attn: Spiritual Care Department 2160 S 1st Ave Maywood IL, 60153. Checks Payable to Loyola University Health System c/o Comfort Care Blanket Project.